Ashley Lucas is Associate Professor of Theatre and Drama and Director of the Prison Creative Arts Project (PCAP) at the Residential College at the University of Michigan. She has written many scholarly articles and is the author of an ethnographic play about the families of prisoners entitled Doin’ Time: Through the Visiting Glass, which she performed as a one-woman show throughout the U.S. and in Ireland and Canada. She presented parts of this monologue and did a general discussion on her work in short workshop at Wellington’s Arohata and Rimutaka Prisons during her two week visit to New Zealand in July 2015. 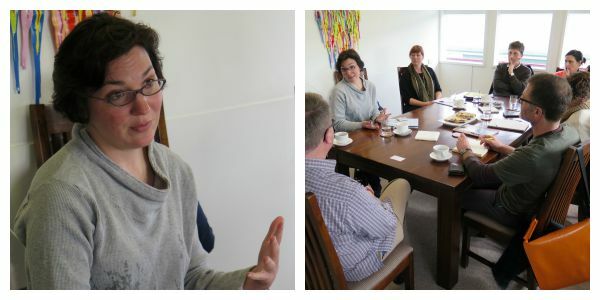 Ashley had meetings with Arts in Corrections practitioners in Wellington and Auckland where she did a presentation at the Faculty of Education at the University of Auckland. Ashley has been involved with prison arts for eleven years and co-edited the book Razor Wire Women: Prisoners, Activists, Scholars, and Artists (SUNY Press 2011). She is currently writing a book about theatre in prisons from around the world entitled The Methuen Critical Companion on Prison Theatre. Original generation time 1.5433 seconds.